The FDA’s new cigarette warning labels have been getting a lot of buzz, underscoring the role of design in public health communication. 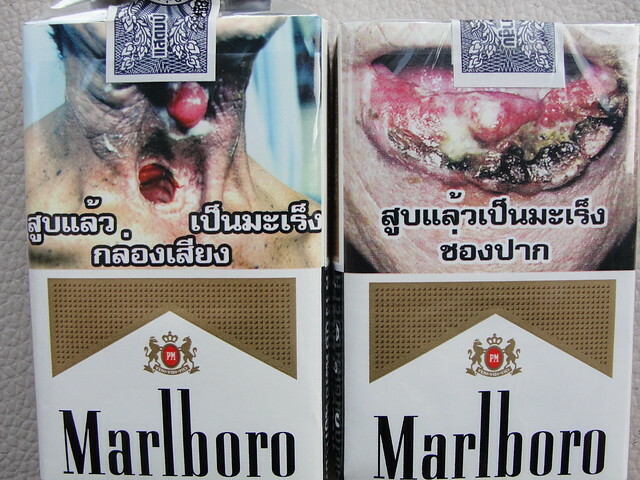 The new designs take up half the cigarette pack, and 20% of the size of ads. According to the Wall Street Journal, the FDA estimates that the design will reduce the number of smokers by over 200,000 in the first year after launch, based on the impact of new warning labels in Canada. I’m a fan of the Hesperian Foundation, which publishes community-based healthcare books like Where There Is No Doctor . In addition to giving their books away at no or low cost, they’ve historically distributed gratis copies of their books in PDF format, chapter by chapter (example). They’ve now set up a new online reading interface (vaguely similar to Google Books), but it’s Flash-based, and can’t be indexed via search engines. Is this an improvement? Which of these online reading interfaces for print books do you like best? We’ve recently had discussions about the font of the VH site, changing it for readability etc. And now, for another interesting take on fonts… the ‘green’ font. From the AP, a recent news story from the UW – Green Bay. The University of Wisconsin-Green Bay has switched the default font on its e-mail system from Arial to Century Gothic. It says the change sounds minor, but it will save money on printer ink when students print out e-mails in the new font. Diane Blohowiak, the school’s director of computing, says the new font uses about 30 percent less ink than the previous one. That could add up to real savings, since the cost of printer ink works out to about $10,000 per gallon. Blohowiak says the decision is part of the school’s five-year plan to go green. She tells Wisconsin Public Radio it’s great that a change that’s eco-friendly also saves money. From Bill at Indiana, an article in Technology Review on mining folders in your computer to track what you really do. This and similar efforts mining email always makes me nervous. The article’s a summary of a human computer interaction conference session.